Ethiopian Military Helicopter crashed in Abyei, Sudan and three people on board are killed, says a report by DW Amharic today. Eight others are said to be in critical condition. The helicopter crashed in Abyei where Ethiopia had a successful peacekeeping mission, as claimed by Ministry of Foreign Affairs of Ethiopia. 23 passengers were on board of UNO 379P Ethiopian Military Helicopter when it crashed in the premises of UNISFA, according to DW Amharic report. The report added that the MI-8 helicopter was carrying Ethiopian soldiers transferred from Kadugli to Abyei, the region’s provisional security force is cited as saying. Cause of the accident is not established yet and Head of United Nations Interim Security Force for Abyei, General Gebre Adhana Woldezgu, is cited as saying that it is under investigation. Ethiopia has deployed 4,500 peace keepers to Abiye. 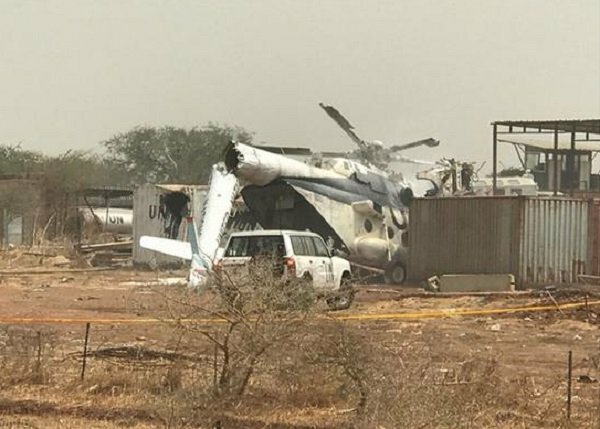 An Ethiopian military helicopter registration Number UNO 379P with 23 passengers on board has crashed today at around 1310H inside the compound of the United Nations Interim Security Force for Abyei (UNISFA) killing three of its crew members. The MI-8 helicopter was on routine operation carrying Ethiopian troops on rotation from Kadugli to Abyei when it crashed. Ten passengers were injured with three in critical condition. The three who are in critical condition have been conveyed to Kadugli en route to Addis Ababa while those not in critical condition are being stabilized at the #UNISFA Level II hospital in #Abyei. The immediate cause of the crash is not yet known. UNISFA’s acting Head of Mission and Force Commander Major General Gebre Adhana Woldezgu said, “We are investigating the incident.” “We are deeply saddened by what happened this afternoon. We are extending our condolences to the families of those who died in the crash,” Major General Woldezgu said. General Gebre Adhana Woldezgu commended UNISFA personnel who responded promptly to the crash by assisting to evacuate passengers from the helicopter, stressing that the casualty figures could have been much higher. “This show of solidarity reflects the spirit of peacekeeping and must be applauded”, General Woldezgu said. The helicopter flew from #Kadugli for the Mission’s regular troop rotation. UNISFA’s sole troop contributing country Ethiopia is currently rotating its soldiers from Kadugli to different sites in the Abyei area. #Ethiopia has around 4,500 personnel on the ground to support UNISFA’s efforts of ensuring peace and security in Abyei.